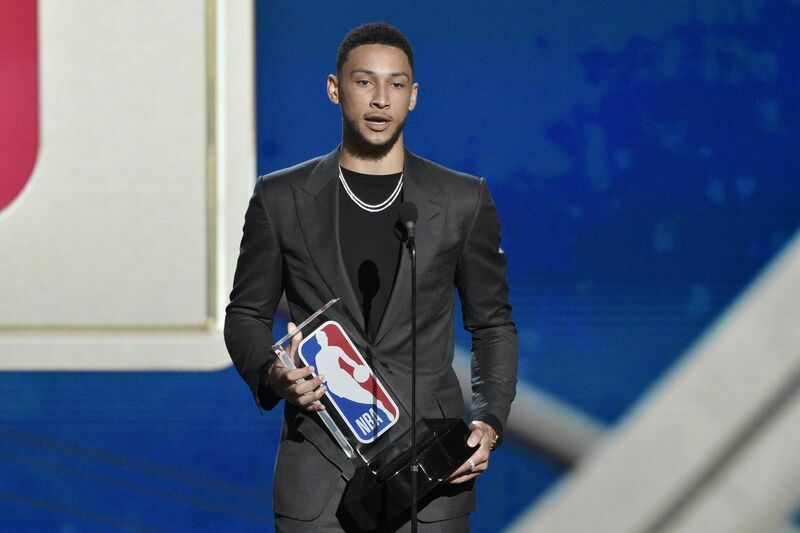 Ben Simmons, of the Philadelphia 76ers, accepts the rookie of the year award at the NBA Awards on Monday, June 25, 2018, at the Barker Hangar in Santa Monica, Calif. His life may become an NBC comedy, Deadline reports. NBC has ordered a pilot script for a comedy inspired by the life of 76er Ben Simmons, reports Deadline. Titled Brotherly Love, the show would be produced by Simmons with Los Angeles Lakers star LeBron James' production company, SpringHill Entertainment, and Kourtney Kang, former co-executive producer for ABC's Fresh Off the Boat, and the sister of Patrick Kang, who's writing the script with Michael Levin. The focus, according to Deadline, would be "on a unique sibling relationship within a multi-ethnic family. Together, they pursue their dreams while navigating life in the spotlight in Philadelphia, a passionate city where sports is in your blood, and your blood is always boiling." The Philadelphia part should be easy: The Kangs are from Lansdale, Montgomery County, and Levin, who grew up in Holland, Bucks County, has been a contributor to the Sixers blog, Liberty Ballers, and cohosts the Sixers-focused podcast, The Rights to Ricky Sanchez, with Spike Eskin. Simmons, the NBA's Rookie of the Year in 2018, is Australian. The son of an American-born father and an Australian mother, he's one of six children. The deal is described as a script commitment with penalty, which usually means that the network has agreed to pay a fee if the show isn't ordered to series. Survivor's Remorse, a critically acclaimed comedy produced by James and inspired by his own experiences as a young NBA player, ended its four-season run on Starz last fall. This post has been updated to add information about the writers.